GEICO. Get a FREE rate quote now! The GEICO Find the Gecko Sweepstakes is now closed, thank you for your interest. Congratulations to our 20 weekly winners of the Magellan eXplorist GC GPS units! While the chance to win a weekly sweepstakes has passed you can still keep your eyes open for one of the 6,000 trackable Gecko’s released as part of this promotion. To see the most recent logs for the trackable Gecko’s take a look at our Latest Movements page. 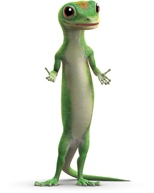 For more information on GEICO or GEICO insurance products, please visit geico.com. Simply enter the Sweepstakes for a chance to win one of 20 Magellan eXplorist GC GPS units, valued at $150 each! This is one of the top-selling GPS devices among Geocachers. Scroll down for more details about this great product. 6,000 trackable Geckos are being released to spread the word about the Sweepstakes. You can assist by finding them while geocaching and moving them along to help them complete their goals. Note: You don't need to actually find one to enter the Sweepstakes! Request a Free trackable Gecko and we'll mail you a brand new, un-activated one (while supplies last) as long as you agree to place it in a geocache and help it get started on a journey. See an example Gecko page here. Thanks for visiting the Find the Gecko Sweepstakes. Ordinarily, everyone's favorite spokesgecko can be found trekking the country, helping people save money on more than just car insurance. However, it looks like he's traveled off the beaten path, and this could be your chance to "cache" in. The Gecko is going to be appearing in geocaches all across the nation, and he's going to need your help to move from cache to cache. Use the unique number on each Gecko travel bug to track his whereabouts. We would be happy to send you your very own Gecko, but you do not need to find or even see one to enter. All you need to do is fill out the entry form and you will eligible to win a Magellan eXplorist GC GPS unit each week that you enter. For additional information on sweepstakes rules and prizes, see the information below. Happy hunting, geocachers. To participate, you must have or create an account on Geocaching.com. If you do not have an account, you may go to the Geocaching.com web site to create one. The type of Geocaching.com membership you choose (Premium or Basic) will not affect your ability to participate or win. Survey/marketing questions which may be asked during registration will not affect your ability to participate or win. Once you have a Geocaching account, complete the Sweepstakes entry form: Visit http://www.geocaching.com/geico, follow the Sweepstakes Entry link via the “Enter Now” button and follow the instructions and enter all the required information requested. You may enter once a week and please note that non-winning weekly entries will not be "rolled over" to future weekly drawing periods. Therefore, you must enter each week to be considered for the weekly drawing period, and there is a maximum of one (1) entry per weekly drawing period. Entries must be made by an individual from a stand-alone computer device and may not be made by proxy or any electronic/automated means such as script, bot, macro or any other similar software or program. All discovered entries made in violation of these Official Rules will be disqualified. In the case of a dispute regarding the identity of the person submitting an online entry, the entry will be deemed submitted by the authorized user of the email address associated with the geocaching.com account and s/he must be eligible and comply with these Official Rules. Sponsor will not respond to any questions about an entry or the Sweepstakes. Once an entry is submitted, it cannot be changed, altered or modified. Enter the Find the Gecko Sweepstakes to become eligible to win a Magellan eXplorist GC GPS unit - a top-selling item and one of the most popular GPS devices among Geocachers! One unit will be given away each week of the promotion. The approximate retail value of the unit is $150. For more information on the Magellan eXplorist GC GPS unit click here. © 2011 GEICO, All rights reserved.